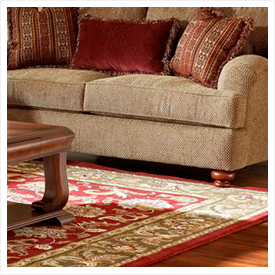 Carpet and Fabric Protection | Magna-Dry | Carpet Cleaning Lafayette IN | Magna-Dry IN | Call now 765-449-0422! Magna-Dry’s proprietary FORMULA-1 Carpet & Fabric Protector creates an invisible barrier of protection for carpet fibers and furniture fabric which helps repel soil and staining materials, thereby prolonging the life and beauty of your carpet and upholstery. There are many retail products available that promise complete stain-blocking protection. Be careful of products that promise unrealistic results. Carpet & Fabric protectors simply provide an extra barrier of protection so spots and spills can be cleaned more efficiently and some irreversible stains can be cleaned before setting. Protector-products like Magna-Dry’s Formula-1 will also help to lessen the overall wear and tear of in-laid carpets and rugs.